The Home Depot is an iconic household name whose products and services are among the top ten perceived brands of any retailer by consumers. It’s hard to believe that this dominant home improvement retailer is barely 40 years old. The Home Depot business strategy has been one that has demanded constant change in some ways. But at the same time, the strategy maintains its focus on core values. 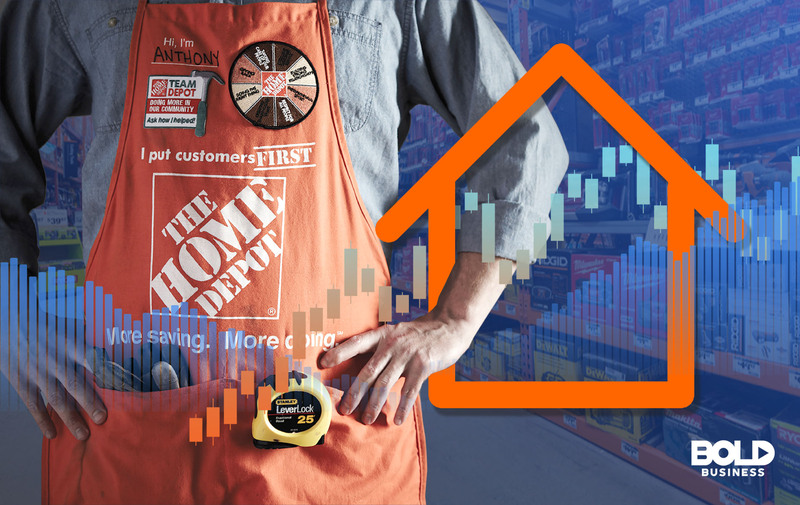 Despite dynamic environments, Home Depot’s growth continues to exceed expectations. And in the process, customer loyalty and market share continue to expand. The Home Depot was founded in 1978, with two stores opening that year in Atlanta, GA. The vision Bernard Marcus and Arthur Blank had for the Home Depot business strategy was a simple one: Provide high-quality service with a vast selection of products at great value. These continue to be the primary components of the Home Depot business strategy today. One unique aspect of this vision, however, involved the use of “do it yourself” (DIY) and “do it for me” (DIFM) enthusiasts to assist customers with their projects. As such, the Home Depot business strategy invests in associate training and development. Customer service is what strengthens brand loyalty over time for Home Depot products and services. Thus, Home Depot was able to distinguish itself from other competitors by its focus on people. Certainly, Home Depot product selection and market saturation have been profound. But the continued commitment to meet consumer needs is what sets Home Depot apart. This focus is having a profound impact on society and the customers whose home improvement projects depend on The Home Depot’s expertise. 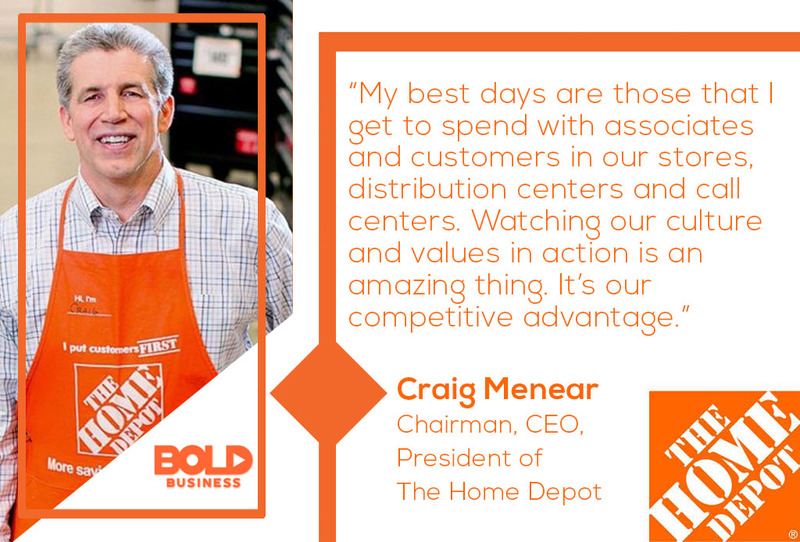 Home Depot CEO and Chairman Craig Menear believes strongly in the company culture and value base. The recession of 2008 had an impact on the entire home improvement retail industry. But the Home Depot business strategy allowed the company to show steady growth despite these setbacks. Over the last ten years, Home Depot growth has seen their share price go from $20 to around $200 per share. A large part of the Home Depot business strategy was to invest heavily in e-commerce while controlling costs. In fact, in recent years Home Depot has rarely opened a new brick-and-mortar store. In the last several years, the Home Depot business strategy has sought to make online and offline retail experiences more integrated. For DIY and DIFM customers, a number of “buy online” programs have been implemented. Products can be bought online and returned to the store. Online purchases may be shipped to a store, picked up in a store, or scheduled for home delivery. Home Depot products through e-commerce now represent 6.1 percent of Home Depot’s $104.32 billion annual revenues. In an effort to reach professional contractors, the Home Depot business strategy is purposely different than competitors. Though professional contractors only represent 3 percent of all customers, their purchases comprise 40 percent of all sales. However, meeting the needs of professional contractors differs from traditional DIY customers. As a result, Home Depot has developed a Professional Referral program to better connect contractors with consumers. Home Depot also provides tools to help professionals better manage and grow their businesses. By constantly assessing its target market, the Home Depot business strategy is always adapting to whatever changes occur. 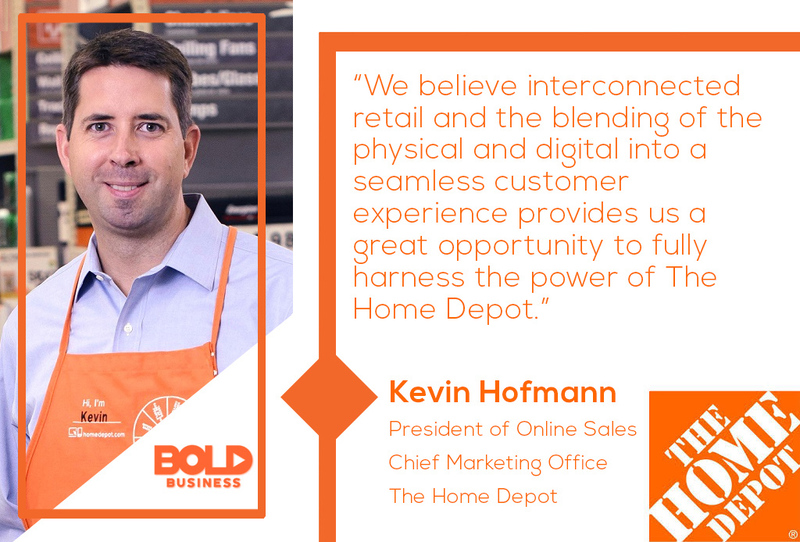 Home Depot President of Online Sales Kevin Hofmann is firmly behind the integration of online- and in-store sales. Bold businesses not only enhance the lives of their employees and their customers, but they also improve their communities. The Home Depot business strategy in this regard has also been consistent since its inception. 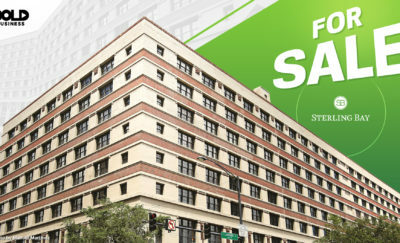 Integral to the company is the Home Depot Foundation. This non-profit arm of the corporation routinely organizes volunteer events to help a number of communities. Since 2011, the Foundation has improved over 37,000 homes of veterans through volunteer efforts. The Foundation plans to train 50,000 tradespeople over the next decade. The Home Depot also holds itself accountable for being socially responsible. Each year, it publishes its Responsibility Report, which highlights its commitment to communities. 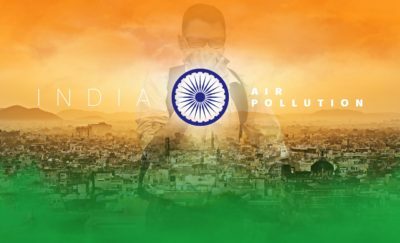 The report addresses Home Depot products as well as sustainable operations, environmentally friendly practices, and its code of ethics. 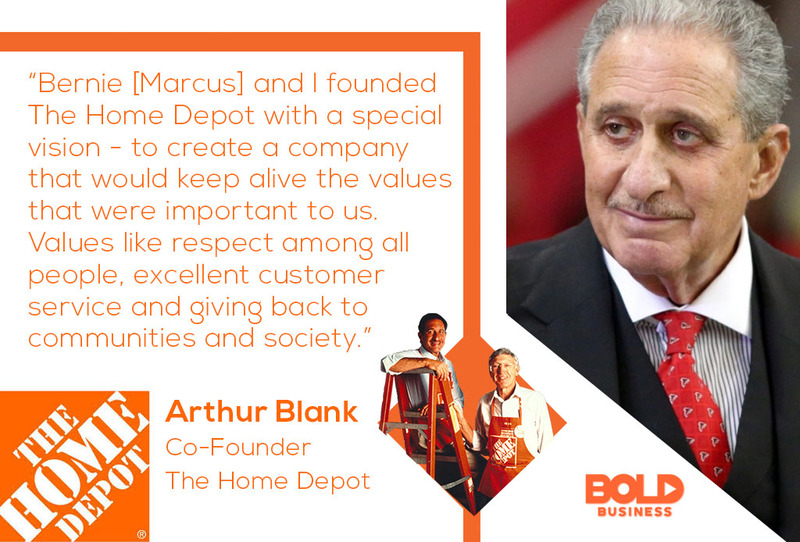 Home Depot founder Arthur Blank sees the respect and social conscientiousness as cornerstones of the company. 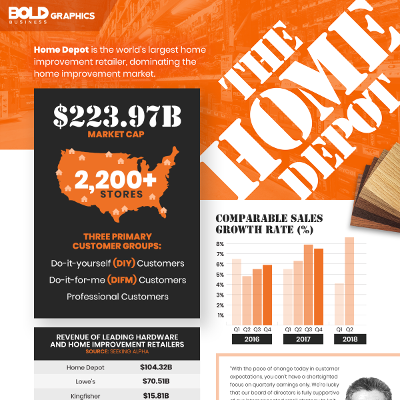 As demographics shift and social trends change, the Home Depot business strategy changes too. This strategy will mean investing $11.1 billion in the “One Home Depot” concept. One Home Depot will see the near-seamless integration of online shopping channels with the in-person store experience. From an improved e-commerce interface to upgrades to distribution and delivery, the vision will ultimately see the two modes of shopping become one. In fact, the home improvement retailer is hiring 1,000 new IT associates to build the platform, which is a similar concept to the Services Platform its rival Lowe’s worked on in the late 2000s in conjunction with their patented Total Closed Loop customer engagement strategy, a brainchild of Lowe’s CIO at the time Steve Stone. In addition, new digital tools are being created to enhance the consumer experience. These tools include augmented reality (AR) mobile apps to see how Home Depot products might look in customer homes. These also include buying guides, know-how instructions, and expert advice for a number of customer needs. Such tools are very appealing to millennials who represent a growing home improvement consumer segment of today and tomorrow. 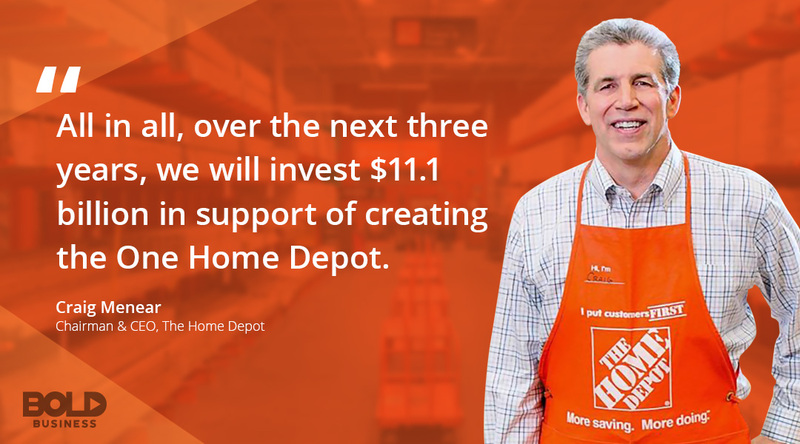 Home Depot CEO and Chairman Craig Menear is bullish on the One Home Depot vision. At the current time, Home Depot has a market cap of nearly $224.69 billion and has over 400,000 employees. And despite a slowing housing market, Home Depot sales for the second quarter 2018 were up 8.4 percent from last year—a $30.5 billion uptick. With the push for One Home Depot and the rise of “interconnected” sales that mesh online shopping with in-store shipping and pick-up, the company’s bold moves are keeping it ahead of the curve. Home Depot growth will likely continue for some time to come and is truly a bold business.